The instruments of an orchestra are like the paints on an artist’s palette: which colours are chosen and how they are combined is vital to the mood and character of the finished work. The drama of the stories and the characters that inhabit them in Tchaikovsky’s ballets The Nutcracker and The Sleeping Beauty are ideal for description through instrumental colour as much as through harmony, rhythm and melody. And Tchaikovsky’s use of orchestral ‘colours’ plays a big part in making these scores so exciting and engaging. The Arabian Dance in The Nutcracker is a perfect example of how instrumentation makes musical ideas clear. Its Orientalist fantasy is conjured up through several elements that each have their own tonal quality. A repeating, rhythmic bass begins with low strings of cellos and violas, later with muted double basses. A first melody twists its way up like rising smoke. This is played by muted violins with ‘much expression’ to sound smooth and sensuous. A second languorous melody, written for a solo oboe, floats down through a series of gracious curves. A little punctuating phrase for predominantly low woodwind sound of clarinets with cor anglais decorates the changes of section. Flute chords and a tambourine rhythm add more decoration around these central elements. The contrast of timbres and pitches makes each part of the music stand out on its own while still complementing the others. Different timbres can also evoke specific characters. In Act III of The Sleeping Beauty, Puss-in-Boots and the White Cat are two of the fairytale guests. They dance a pas de deux in which their identity is described in sound. The opening phrase is a musical version of a cats ‘miaow’, with the reedy quality of oboes and bassoons imitating the penetrating animal tone. Tremolo strings that follow (with a little pizzicato explosion at the start of the sound) tell us that nervous suspense is in the air. In fact, the pas de deux is a stylized chase by one cat of another, with feline jumps, twitching whiskers and ears in the choreography synchronized with the music. 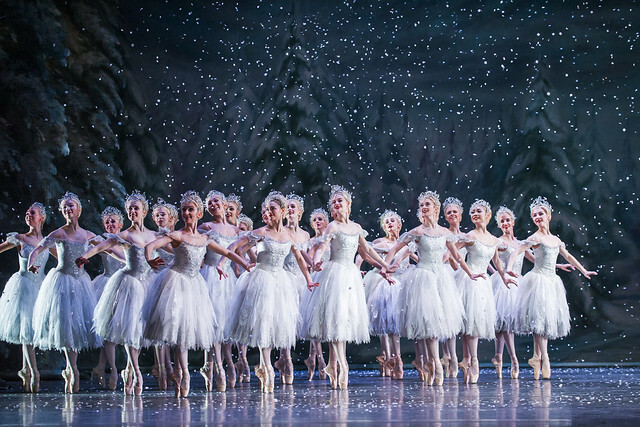 A more sustained quality of motion is conveyed in the Dance of the Snowflakes in The Nutcracker. At the start, the orchestration depicts lightness and flurry: swift breaths of flutes and piccolo are echoed by a shimmer of cellos, intensifying in frequency and length as the snowflakes appears in greater quantities. With the waltz fully under way, a sustained melody is made distinctive through unexpected children’s voices, not singing as characters but as another quality of sound in its own right. The use of the full orchestra is one of the thrills of both these ballet scores, and even here Tchaikovsky’s lets us hear individuality too. The Overture to The Nutcracker is a big effect on a small scale. Upper strings are used and woodwind are pitched high in their ranges – no cellos or double basses, and no blaring trombones. A ringing triangle emphasizes the high frequencies. It’s a full orchestra – but a toy one to match the theme and scale of this Christmas Eve adventure. The Prelude to The Sleeping Beauty is of an entirely different order. It’s as full as you like from the start: a dramatic attention-grabbing theme, interspersed with strident brass. The harps are the only instruments not playing in the opening bars – the sound is too loud and aggressive for their delicate, ringing quality. Yet in the second section, harp arpeggios sweep magically over the repeating low notes of the strings to introduce the flowing Lilac Fairy theme on flutes and clarinets. As this section builds, all of the violins, cellos and violas play the main theme together – a glorious, soaring sound where Tchaikovsky uses as a whole orchestral group as though it was just one big solo. You’d think nothing could top that, but Tchaikovsky finds a way: trumpets! And the Prelude concludes with a glorious fanfare over shimmering chords of strings, woodwind and harps. It’s another huge orchestral sound – and so different from the one that began the Prelude. Whether on the scale of just a single instrumental line, a small group or the entire orchestra, Tchaikovsky knew how to use all the potential of orchestral sounds to animate the drama, direct our ears and – with these great ballet scores – complement our eyes. How wonderful it would be, to experience the Magic of Tchaikovsky's Sleeping Beauty before the curtains close next March.My unforgettable backstage tour of the Royal Opera House, back in 2011, is still a memory I hold very dear to my heart. One of the best moment in my life as a dance student was to be seeing don Quixote at Covent Garden. Royal Opera House was a Wonderfull place to have this fantastic experience. Kisses from Spain. Both scores are are really masterpieces of orchestration, which are still today the best study materials for young musicians. The use of piano as a "normal" part of the orchestra in Sleeping Beauty" is unique and in Nutcracker the new constructed celesta was used the very first time in a bigger score as well. The combination of celesta, flute (played in frullato technique) combined with violines in flageolett was in 1892 a complete new sound, never ever heard before. How amazing it is that now we can enjoy, explore and delve into the arts even when we are far away from the royal opera house. This is a very inspirational article. Thank you for the explicit explanation of the music and dance.